Passive Resistance in the Transvaal - “The Steam Roller v. The Elephant. (The Elephant ‘sat tight’: the Steam Roller exploded.”) - Sunday Times, 1906. The British made the Transvaal a self-governing colony at the end of 1906 and the Government headed by Gen Botha and Gen Smuts tried to push through legislation to curb the entry of Indians and other Asians into the State. 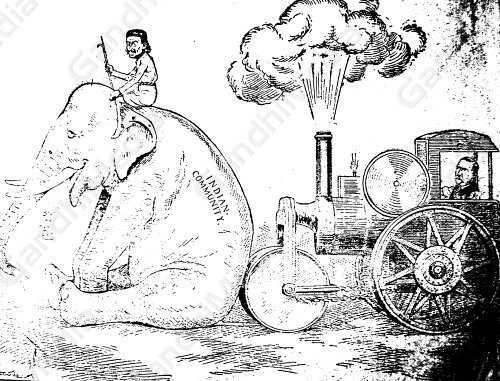 Gandhi organized the Passive Resistance Association, and against this elephant blocking its path the Government steamroller found it could not make headway.